Current club: Real Madrid C.F. Arsenal boss Unai Emery could be prepared to part ways with Henrikh Mkhitaryan when the transfer window reopens at the end of the ongoing campaign. Jose Mourinho, regardless of recent criticism, is arguably one of football's best ever coaches; but where will he head to next? 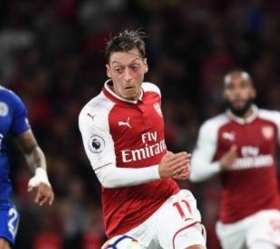 Arsenal manager Unai Emery has spoken positively about the performance of Mesut Ozil against BATE Borisov, although he has refused to guarantee him a regular starting role. Arsenal have emerged as surprise contenders to secure the signature of in-demand defender Matthijs de Ligt from Ajax at the end of the campaign. Arsenal playmaker Mesut Ozil has no plans of leaving the Gunners during the summer transfer window despite falling down the pecking order under manager Unai Emery. Arsenal have reportedly identified Bayern Munich attacker Kai Havertz as a potential replacement for Mesut Ozil when the current season comes to a close. Arsenal boss Unai Emery has said that he has the trust in his players to overcome the 1-0 deficit to BATE Borisov during the second leg of the Europa League round of 32 stage. Arsenal are reportedly keeping tabs on the performances of Serie A duo Suso and Nicolo Barella with a view to a possible approach in the summer. Arsenal midfielder Mesut Ozil is reportedly being offered to clubs across the top leagues after finding himself out-of-favour under manager Unai Emery this term. Arsenal boss Unai Emery is reportedly benching midfielder Mesut Ozil with the intention of forcing him out of the club when the season concludes.